Blue Bee Cider announced on February 18 that it will relocate and expand its cidery into the old city stables in Scott’s Addition, and will invest more than $1 million to renovate the historic property. The company also plans to expand its existing orchard, bringing agriculture back to Richmond, and purchase over $250,000 worth of Virginia-grown apples and berries from Virginia farmers over the next three years. 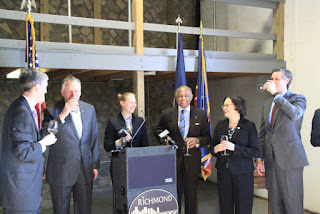 Gathered in front of a crowd of cider enthusiasts, Mayor Dwight Jones, Governor Terry McAuliffe, Virginia Secretary of Agriculture Todd Haymore, and Courtney Mailey, owner of Blue Bee Cider, all spoke about the new venture. Governor McAuliffe stated, “I am pleased to announce Blue Bee Cider’s investment in the City of Richmond, which marks new opportunities for Virginia’s growing hard cider industry. Blue Bee’s investment bolsters Virginia’s reputation as a top East Coast craft beverage destination and highlights the growing and important link between agriculture and tourism across the Commonwealth. The Commonwealth is partnering with the City of Richmond and Blue Bee Cider on this project through the Governor’s Agriculture and Forestry Industries Development (AFID) Fund, which is administered by the Virginia Department of Agriculture and Consumer Services (VDACS). Governor McAuliffe approved a $50,000 grant from the AFID Fund to assist with the project, which the City of Richmond is matching with local funds.